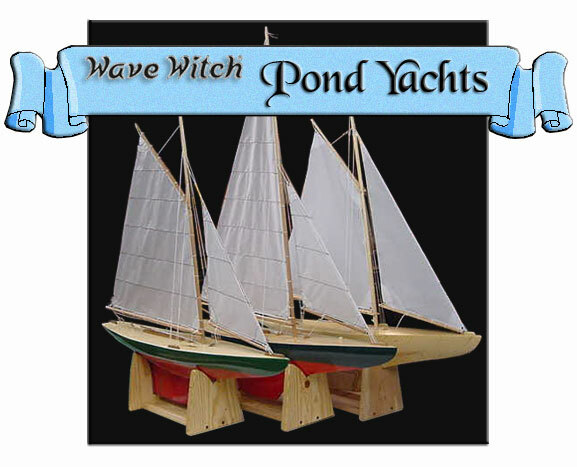 There's a new boat in town; it's the Wave Witch Woodie! Hunt surfs a small wave at "Sharks". 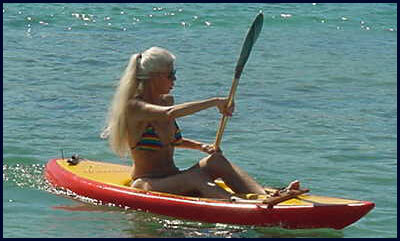 Hunt Johnsen Designs, formerly located in Honolulu, Hawaii, is now based in Southern California, where Hunt and Judy Johnsen lovingly handcraft the popular Wave Witch kayaks. Our water toys now include five kayak designs covering a wide range of kayaking needs, as well as our Pond Yachts -elegant toy sailboats just like the ones we had as children. To learn more about Hunt and his passion for design and building, read the interview from the "Designers" area of the Sit-On-Top Kayaking Web site. 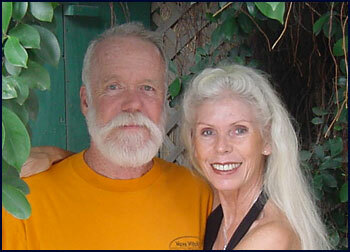 The Wave Witch family of kayaks originated in 1984. 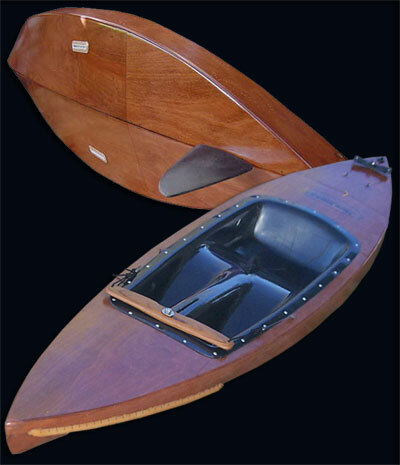 Designed to provide a boat with better paddling characteristics than the wave skis, and better surfing ability than the usual kayak, the sharp and deeply veed clipper bow slices through chop cleanly and with little resistance, while the unique reversed canoe stern with its flat run and hard chines prevents squatting and lifts the boat while surfing. The design has proven to be somewhat magic - it paddles faster than any other boats in its length class and its surfing ability is unequalled. All Wave Witch kayaks feature an adjustable footbar and spade rudder steering, giving them great maneuverability and precise control in all conditions. Additionally, all Wave Witch kayaks include a standard deck fitting configuration accommodating thigh straps, seat backs and deck cargo tie-downs, a carry handle, drain plug, plus one bombproof fitting in the bow for a leash. A breakwater comes standard on the Wave Witch Classic and the Wave Witch Witchlet. Wave Witch kayaks are of high quality fiberglass construction, with glassed foam stringers and ribs for rigidity with light weight. A variety of custom accessories are available as well as Kevlar, Carbon, Kevlar/Carbon 50/50 hybrid cloth, if desired. This is the Original, in production since 1985. 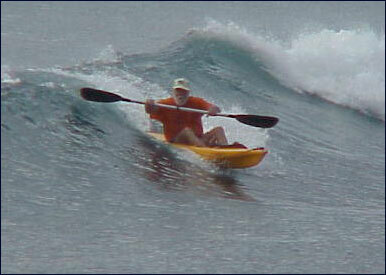 The Wave Witch Classic is a relatively low volume kayak for fast day tripping and surfing. This model has a useful capacity of up to 250 lbs., although it is often used by bigger paddlers who don't mind getting really wet. Length: 12'5" Beam: 24" Weight: 30 lbs. Recommended load: 250 lbs. max. A Witch for the bigger surfer/paddler or those wishing to carry more gear, this boat has considerably more capacity and storage volume, yet retains its paddling speed and surfing ability. Length: 12'7" Beam: 24 1/2" Weight: 33lbs. Recommended load: 275 lbs. max. Designed in 1994 as a surfboat for smaller faster breaks, the Witchlet has proven to be a versatile little machine. 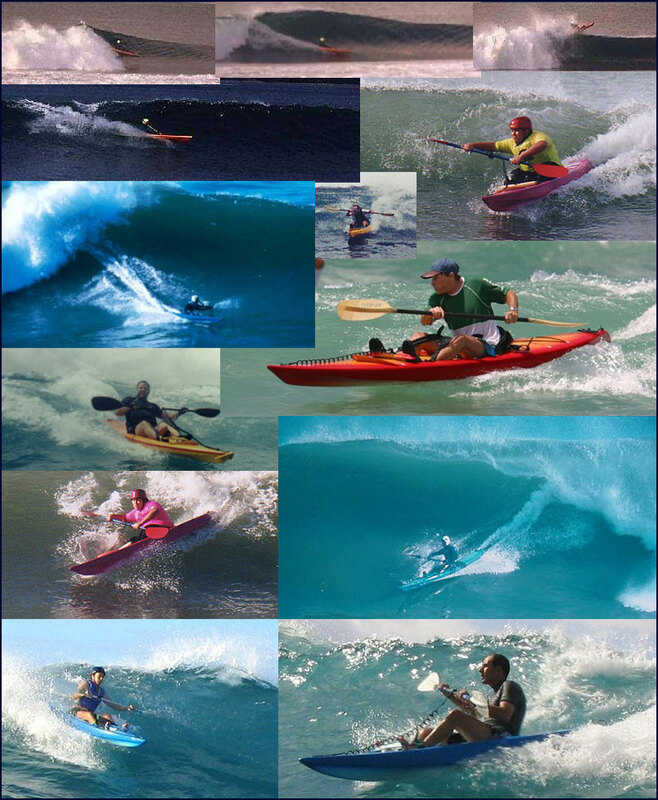 Prototypes won the sit-on-top class at the 1995 World Kayak Surfing Championship contest in Costa Rica, both men and women's divisions. The Witchlet has also proven to be a good touring boat for lighter paddlers. Length: 10'6" Beam: 23" Weight: 26 lbs. Recommended load: 200 lbs. max. The Wave Witch Pocket Rocket features hard edges and a softer bow design, allowing radical surfing moves while retaining the paddling qualities of its longer, larger Wave Witch relatives. In addition to rudder steering and O'Fish'L Fin Systems turning standard on every Wave Witch kayak, our EPP foam full boat pillar is a standard feature on the Pocket Rocket. Length: 8'11" Beam: 25" Weight: 25 lbs. Recommended load: 200 lbs. max. Check out the Wave Witch Woodies! From time to time we have built mahogany ply versions of our designs incorporating a sleek composite cockpit . These boats perform as well as our glass boats and are quite elegant - it's a little like surfing a Stradivarius. All surfaces are resin coated, with glassed exteriors. These boats are as durable as they are good looking. Because each Woodie is entirely made by hand, we are able to fine tune the boat to each paddler to a degree not possible in a molded boat. The average Woodie is 10' 3" in length, but we can easily increase or decrease length, as well as beam or freeboard, to suit. All Woodies are equiped with the standard Wave Witch rudder and steering system, thigh strap fittings, carry handle and a secure leash attachment at the bow. The Wave Witch Owners/Operators Manual: You may download the Wave Witch kayak manual, with some important tips and tricks as an .html file or as a .pdf file. - A BIG Thanks! to the folks, many who have become our friends, who have allowed us to share with you some shots of the various Wave Witch models in action, including Martin Leonard, Izzy Godoy, Keith Sinclair, Mike Harken, and Dave Hughes. This is a real pond yacht, not just a display item! Sailing Pond Yachts was a popular pastime in the 19th century and much of the last. Racing was often intense, and large sums were often wagered in some locales. These Pond Yachts are not just for display, though they would look great on your mantle. Take them to a lake or pond, or even the ocean and watch them perform. By adjusting the sheets and the rudder you can make them sail upwind or downwind. Get two and race them! 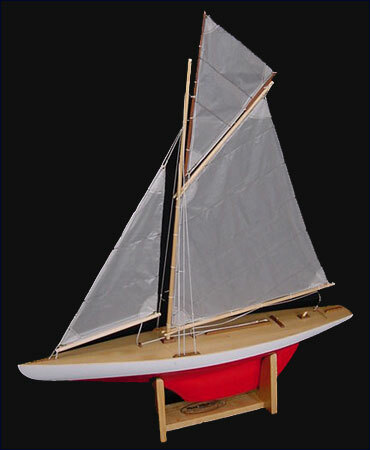 They have hollow wooden hulls with cast ballast, ripstop nylon sails and Dacron rigging. 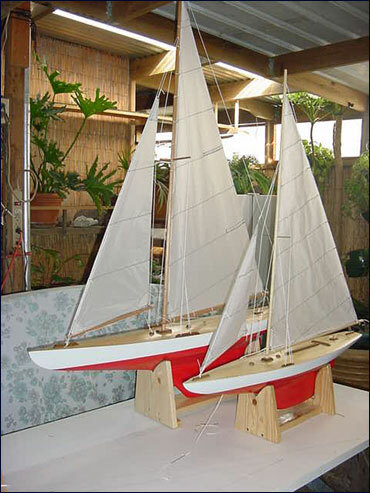 We build these miniature Yachts in various sizes and with various rigs. 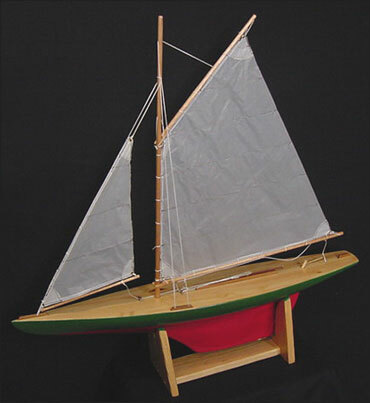 Choose from Cutters, Sloops, Gaff or Marconi rigs, for the really adventurous, a Schooner, Ketch or Yawl. 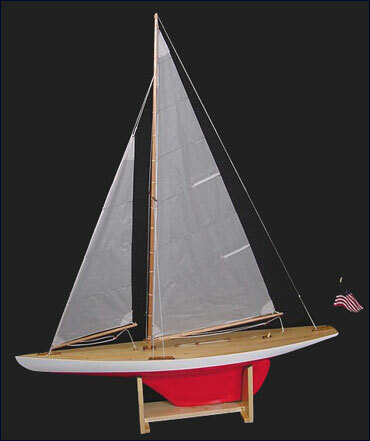 Prices, including display stand, start at $225 for a simple 36” sloop. The 36” Gaff Topsail Cutter is $265. Designed and built by Hunt and Judy Johnsen. 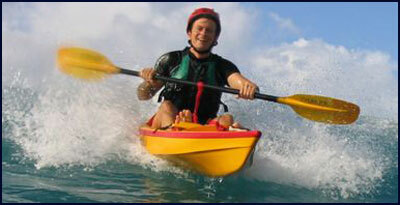 See Wave Witch Kayaks. Martin's HJD page - Cool! Mahalo, Martin. If you would like to exchange links with us, just drop us a request e-mail and upon review and approval we will ad a reciprocal link to your site on ours. Feel free to link to our site with only text (http://www.huntjohnsendesigns.com/) or include this banner with your link. Resize banner proportionally to fit your site requirements.